BAN BIRD SALES AUSTRALIA- THOUSANDS OF BIRDS NEED TO BE ADOPTED! Birds are born to fly and forage freely!! But birds can’t fly in Australia. Australian companion birds continue to be subjected to a miserable life! 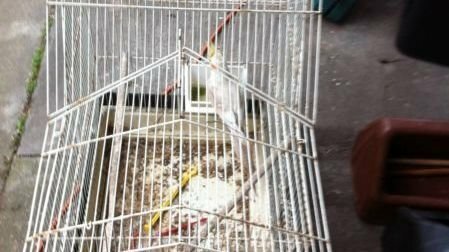 You don’t need to look far to see bird abuse and neglect and horrible bird exploitation. There are thousands and thousands of birds bred to be sold….as a hobby!! Birds are highly intelligent but instead sold for fun and extra cash! Bird breeders and sellers are having a ball selling and trading birds anywhere because they can! Because no one is stopping them! And there are NO BIRD LAWS IN AUSTRALIA! Codes of Practice are NOT mandatory so bird keepers do whatever they want. “The bird breeders and bird sellers have taken advantage of the fact that no authority is monitoring or enforcing laws to protect how birds are handled and cared for”. I have seen for myself at private bird breeder properties, pet shops, bird cage makers displaying birds and markets around Australia- TRAGEDY. The constant breeding and captivity results in huge psychological and physiological trauma to birds. Most people, including breeders, have no idea how to care for and accommodate companion birds. They don’t care that their birds are expected to breed, breed and breed. They don’t even consider the emotional and physiological implications on the bird when the bird is expected to separate from the bird family or bird partner- just to be sold….as a hobby. “I could easily rescue thousands of birds every day”. There is an oversupply and most of these poor birds are sold or traded to inexperienced bird carers who perceive them as a ‘pretty object.’ Most other birds are stolen as eggs from their mothers and incubated in bedrooms throughout Australia. It is unimaginable that Australian birds can exist in such a condition and bird breeders and sellers are proud of showing photos of the neglected birds for all the world to see! • Ban the sale of companion birds at markets, expos and sales, pet shops, online and backyard selling. • Introduce companion bird welfare laws as the current codes of practice are totally ignored and not mandatory. • Ban bird breeding and promote bird adoption to save thousands of neglected and rejected homeless birds. Paris Yves has cared for birds all her life. She is a professional Bird Behaviourist and Bird Counsellor and regularly liaises with world-renowned animal behaviourists to ensure she is on top of bird behaviour research and findings. An experienced media commentator, Yves has become the voice of welfare and legal rights for companion birds in Australia. no more breeding and selling of companion birds – they don’t have a choice. we do. Stop the parrot pet trade all over the world. No life sentence of imprisonment for birds. Please don’t take clip your feathered friends wings ! These amazing creatures are cruelly hobbled by humans all the time, but flight is a huge part of who they are. Don’t take that away from them! Rescue birds need your love.